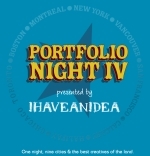 If you're looking to break into the creative side of the advertising business or your sick of your job and you need a change, you'll be happy to know ihaveanidea has expanded its Portfolio Night, an event that placed creatives and their portfolios in front of the industry's creative gurus. For Portfolio Night IV, students enrolled in advertising programs, graduates, and up-and-coming creatives can meet top creatives from New York's Strawberry Frog, San Francisco's Butler Shine & Stern, Chicago's Ogilvy & Mather and Modernista in Boston. DDB Worldwide and Canadian agencies TAXI, WAX, Change Advertising, Bos and Rethink. So tidy up that portfolio and get it ready for the May 4th event. Beginning today, you can register here. Ignacio from ihaveanidea was down in Palm Springs chatting it up with Clio Awards judges who were preparing for the Clio Festival that will take place on May 13-16. While there, Ignacio posted commentaries, video interviews and candid behind-the-scenes footage of the creative gurus who will decide the fate of thousands of ads vying for Clio. You can check it all out here. We were going to leave this one alone because mistakes do occur. We even left alone a previous mistake involving the placement of an image which looked like it belonged to editorial rather than the unmarked ad it turned out to be. But, two mistakes in a short period of time just can't be left alone. While we love the folks over at MediaPost but today, they made a very huge mistake. Late this afternoon, we received this email from MediaPost inviting us to their Email Insider Summit May 21-24 in Scottsdale, Arizona as a VIP. All expenses, including airfare, accommodations and conference registration, would be covered. We thought, "Damn, Adrants has finally arrived!" We were all excited to spend four days at the Boulder Resort and Golden Door Spa basking in the Southwest sunlight while hanging with industry big wigs. That is, until a second email arrived. A tipster who wishes to remain anonymous traveled to the AAAA's Conference last week and tells us about an interesting observation. We'll let them tell it in their own words. "I was flying to the 4A's conference and something struck me as funny. There were 3 4A's staff (senior level) heading out to the conference all in first class. There were about 6 agency execs (one being a c-level) all in coach. Per the presentation at the meeting over 70% of the 4A's revenues comes from dues paid by the agencies. Unbelievable that they [the AAAA's execs] chose to spend it less responsibly than the agencies that give it to them in the first place. Lower spending = Lower dues." Right on. Ah, but how ad wags love their perks. Listen up all you advertising students. This your chance to the advertising industry's biggest boondoggle, the Cannes Lions Advertising Festival. Ad agency AKQA has organized the first ever Future Lions Competition for all you global ad students. The competition is now open and accepting entries. The goal of the competition is to "showcase forward-thinking ideas and concepts created by the next generation of global advertising superstars." The Future Lions site provides you a creative brief, FAQs, winning tips from AKQA's creative geniuses, downloadable posters and an online submission form. Adding to the already busy ad:tech Conference social schedule, ad: tech itself will host a Live Connect party at the upcoming San Francisco show. Dubbed the Grand Opening Extravaganza, the event will feature The Cheesballs, a performance troop, food and drinks. In conjunction with the party, ad:tech is also promoting its online community, ad:tech connect. Underscore Marketing President Tom Hespos is out at OMMA West in Hollywwod and has offered up some observations about the first day's interactive online marketing conference. While Tom heard from many people today eager to jump on the blogging and consumer-generated media business model bandwagon, most of them didn't have a clue what they were talking about. He also mentioned that the blogging is being unfairly trashed with flawed stats and treated as if it were some sort of braodcast playground waiting to grow up into a "real medium." In listening to the various presentation, Tom noted much of what he saw seemed to have been lifted from other's mouths with agency wonks attributing their own names to the content. And finally, Tom realizes he's been mispronouncing Publicis' new agency wrong. It's De-NOO, not DEN-you-oh. The conference concludes Tuesday. In conjunction with Leo Burnett and Arc Worldwide, Contagious Magazine is hosting an event in Singapore called Engage 2006. The event will cover viral advertising, video games, branded entertainment, mobile marketing, interactive TV, future forecasting and experiential retail. Speakers from London, New York and Asia will offer insight and discuss the future of marketing. Speakers include John Harlow, cofounder of Naked; author and consultant Joseph Jaffe; Steve Wax of US-based brand storytellers Campfire; mobile marketing specialist Jason Deland of Anomaly NYC and Adrian Pettett of branded content specialists Cake. The event is a not for profit event open to all agencies and clients in the area as well as local media and design students with the aim of encouraging young Asian talent to prepare themselves for our crazy industry.